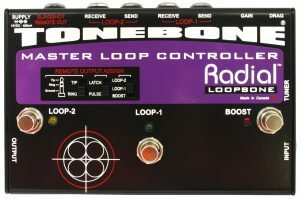 The Loopbone is a high-performance effects-loop switcher that enables the guitarist to insert, remove and combine pedals via two independent signal chains while eliminating the tone robbing problems associated with other switchers and the induced noise caused by true-bypass alternatives. The design begins with Radial’s award winning 100% discrete class-A buffer circuit for the very best audio fidelity and lowest noise. 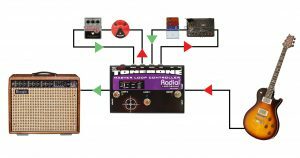 This is augmented with Drag Control – a load correction circuit that allows the user to reintroduce the natural tone and feel of the guitar as if connected directly to a tube amplifier. To eliminate ‘switch-on’ noise, the Loopbone employs photocells that ramp-up and ramp-down the signal for smooth, pop-free performance, even when used with high-gain amplifiers. 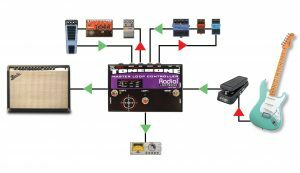 Using the Loopbone is easy: plug in your pedals and switch on the loops. The two effects loops are wired in series to enable the first loop to be fed into the second. 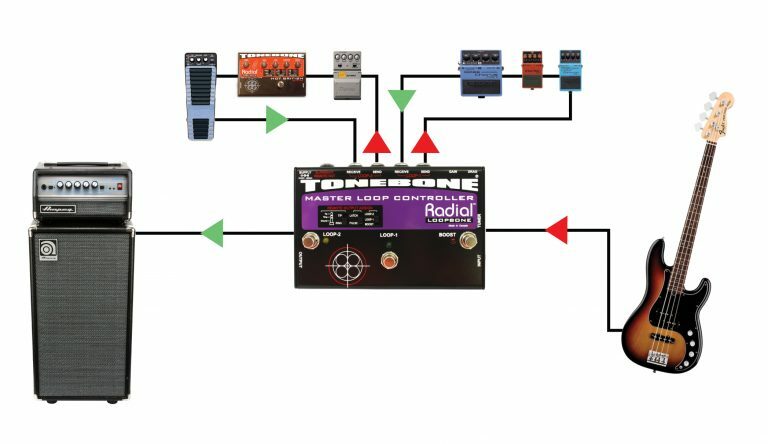 This enables the guitarist to combine effects to create complex signal paths or take noisy pedals out of the primary signal chain when not in use. 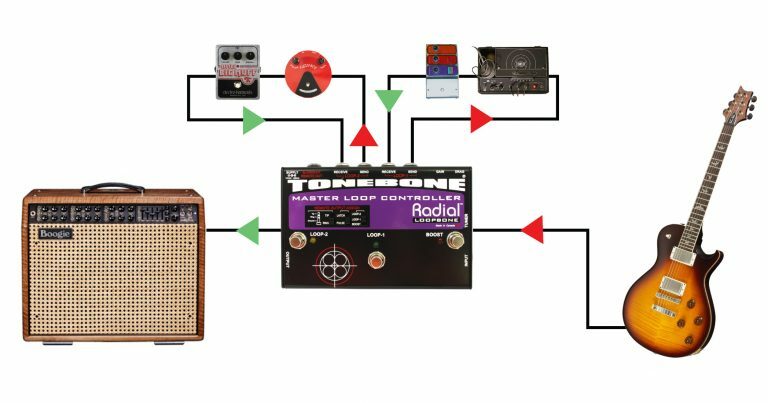 For added control, the Loopbone is equipped with Slingshot™, a remote control that can be used to simultaneously change channels on a guitar amp, turn on an effect, or activate another Slingshot equipped pedal like the Radial Headbone. Just imagine… one foot stomp and suddenly, your chorus, delay and overdrive are activated while your amp changes channel! Extras include a built-in power booster with ‘set & forget’ level control for soloing, plus a separately buffered tuner out for ‘on-the-fly’ adjustments. 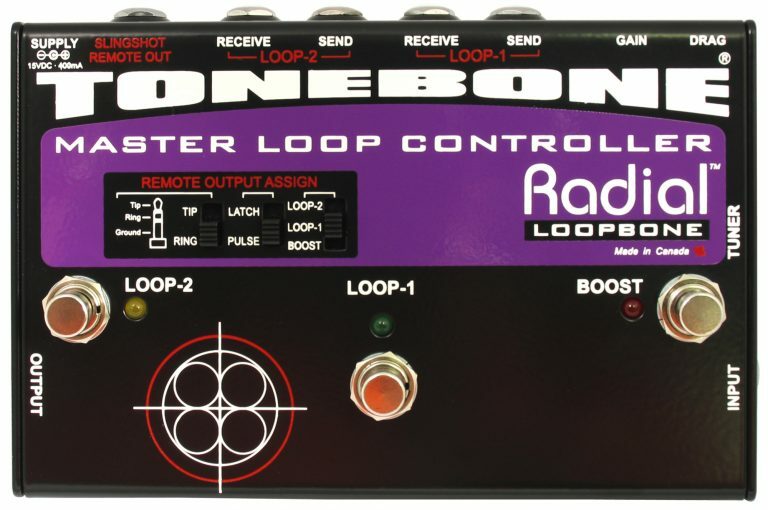 The Loopbone lets you incorporate older 'noise-prone' pedals into your signal chain and take them out when not needed. 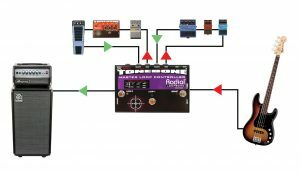 This also assures the best tone right to your amp for your clean sound. Each loop can be used individually or strung together in series. Connecting your guitar directly to a wah or fuzz retains the natural relationship between the pickup and pedal for a more desirable tone. The Loopbone then buffers the signal for longer cable runs to 15 meters (50') without noise. Use the Loopbone on bass to ensure the sound of your instrument is not compromised when passing through lesser quality buffers. 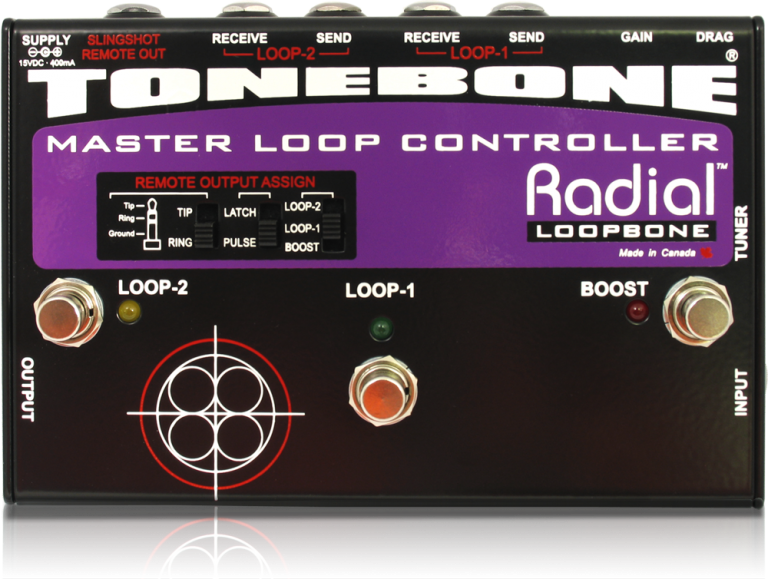 The Loopbone's 100% discrete class-A buffering will deliver your full tone without affecting the bottom end.